As rapid changes transform the world into a place characterized by network- based societies, there is an increasing need for manufacturing systems that can swiftly meet changes in market demand, steadily produce the right products at the right time, and evolve permanent and flexible solutions. 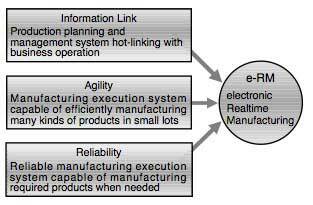 Yokogawa has named this new manufacturing flow of the network era "e-RM" (short for electronic Realtime Manufacturing), and strives to develop control systems to materialize it. In the realm of process control too, applications that require their processes to be broken down and distributed demand unprecedented agility to cope with changes and call for flexible and highly cost-effective systems. The Network-based Control System (NCS) architecture is ideal for embodying e-RM throughout production activities and the STARDOM network-based manufacturing solution is a core group of components that compose an NCS. As the world's societies become more connected, market competition is becoming more ruthless and transactions are performed at ever increasing speeds. Deregulation has ignited global competition throughout the world. The proliferation of Information and Internet technologies have accelerated the growth of global competition, with life cycles for high tech products having lives measured in "dog years" (in each normal year they advance seven years). The shorter lifecycles of the high tech components and assemblies such as semiconductor parts and plastic parts are already beginning to impact the manufacturing of the raw work pieces and materials for these parts. New manufacturing strategies aim to gain profits both for peak demands and normalized production. In the short run, manufacturers must respond to sudden market changes to maximize return while maintaining base production on standard of-the-shelf items. Delay in development or production can now directly jeopardize the life of a company. Companies must strive to raise production efficiency in order to survive the fierce global competition. They can achieve this by establishing a production and information technology system capable of quickly catching up to market trends by means of collaboration. Usually companies focus their efforts on streamlining management systems such as enterprise resource planning (ERP) and supply chain management (SCM); however, a new production system that allows the company to respond quickly to ever-changing market demands is also important. The new system should produce in real time and the right products at the right time and at a profitable cost. Reliability of assured quality, costs, and lead times of entrusted manufacturing It is imperative that companies meet these requirements while possessing the agility to meet changes in the market over the long term. Despite the e-RM era, process automation systems (PASs) still constitute the basis of production systems. 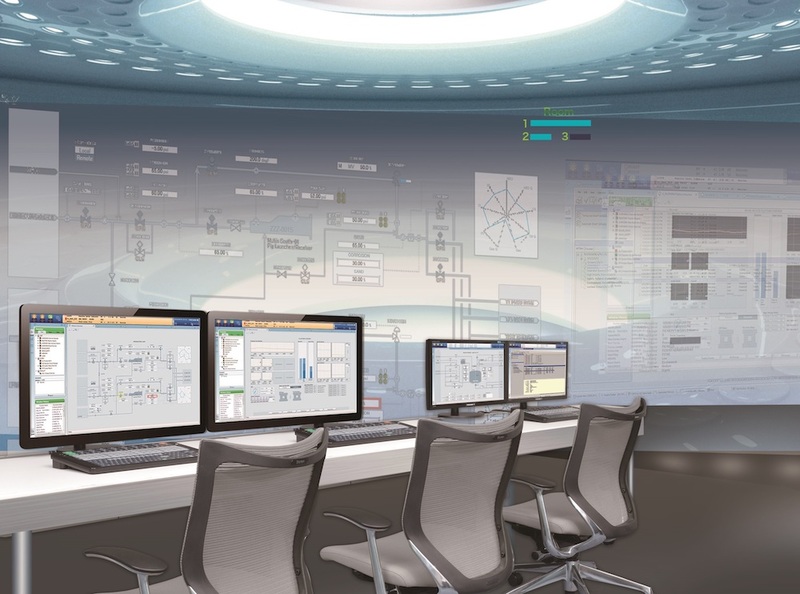 Now, a quarter of a century after the debut of the world's first distributed control system (DCS), Yokogawa is convinced that DCSs are not the only solution for today's PAS market. However, there is no change in the significance of DCSs, which still provide high reliability, effortless engineering, and excellent operability, as well as assure long-term parts supply and servicing. A new realm that requires control over wide areas and of distributed processes in highly flexible, and coordinated networks with a reasonable cost performance rather than full-scale reliability has emerged in the PAS market (see Figure 2). Most users in this new realm produce generic materials that are composed of relatively higher-value-added materials. Yokogawa defined this new realm as a new paradigm market inside the PAS market and considered it to have different requirements than those for conventional DCSs. Since this new paradigm market is closer to the consumer product manufacturing industry, and its changes are bigger, the adoption of SCM is brisk. In terms of production systems, it is characterized by the process that has the coexistence of regulatory control and sequence control. For actualization of e-RM, Yokogawa has developed products ideal for the individual bifurcated markets. As referring to the DCS, DCS has been still an indispensable system in such applications requiring total reliability as the oil refinery and petrochemical industries. Therefore, for those industries Yokogawa has developed the latest DSC, the CENTUM CS 3000 R3. On the other hand, Yokogawa proposes the Network-based Control System (NCS) as a production system architecture ideal for implementing e-RM, and has developed the STARDOM network-based manufacturing solution as a group of core components composing an NCS. 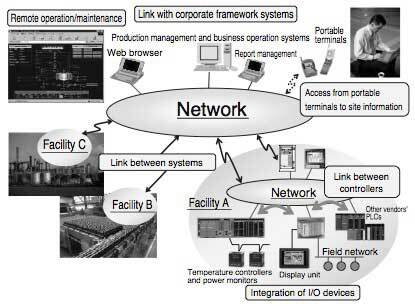 Information link: By using IT networks to the greatest advantage, production-related, diverse equipment, facilities, and field devices must be linked to each other, and related systems such as ERP, SCM, and manufacturing execution system (MES) must be linked to each other. Agility: A production system consisting of distributed facilities and equipment must allow for swift modification whenever needed such as at the startup of a new production facility and a change of the brand manufactured. Reliability: The production facilities, equipment, and system must be configured to reliably manufacture no less than and no more than the required amounts of products when needed. The NCS architecture—-which allots "open," highly independent components along an IT network—-provides the best means of fulfilling the above requirements. To achieve the information link, it is necessary to connect "open" and off-the-shelf components to a network. To attain agility and scalability, all processes, facilities, and equipment must be configured and engineered using standard methods. In addition, the reliability of the manufacturing system providing support for these features shall be attained using network technology. In the NCS architecture, ideally, each unit should act autonomously while transmitting information throughout the network and acting in concert with the related, surrounding framework of systems in order to actualize a flexible manufacturing system. The facilities and equipment are distributed by the functions or location, independently installed, and connected to a network based on a standard technology such as the TCP/IP. Use of a standard network provides the means to swiftly make full use of the technology of Java, a platform- independent language, the Simple Network Management Protocol (SNMP), the latest security technology, and general- purpose protocols such as the Simple Network Time Protocol (SNTP), as well as contemporary general-purpose technologies such as giga-bit communication, satellite communication, and mobile telephones (see Figure 3). Autonomous controllers have compact and rugged hardware suitable for field installation and are designed for distributed installation at each piece of equipment, machine, or facility. Autonomous controllers are offered in two models: FCN (short for field control node), a modulus design with hot-swappable, duplexed modules (optional), and FCJ (short for field control junction), an all-in-one style with incorporated I/O and field network interface, designed to be built into a machine or equipment. Autonomous controllers designed for high reliability build a reliable e-RM-based operation environment in which contracted delivery dates and quality are assured. In addition to conventional combined functions such as regulatory control and sequence control, each autonomous controller runs a Java virtual machine (JVM), the environment in which network-standard Java programs run, and autonomously transmits information without relying on a computer. For instance, an autonomous controller built into equipment will not merely perform regulatory actions such as sequence and loop control but will also carry out equipment diagnostics and maintenance management which previously involved periodic inspections by humans or a diagnostics program in a separate computer, thus making the equipment autonomous. The equipment itself will supervise the status of each part, and transmit a notification by e-mail when the fatigue limit is reached, when the number of times operated reaches a specified limit, or when a management indicator such as the turnaround time exceeds the limit, which will increase the availability of the entire equipment. Besides, the diagnostics and operation management programs need not be made immutable; they can be downloaded, as necessary, from a distant location via network. As equipment is becoming more advanced and complex and the importance of support for equipment vendors is accordingly intensified, such equipment autonomy is a crucial functionality for meeting the basic requirement of being capable of manufacturing the right goods at a the right time. Besides, with superb connectivity to link up distributed programmable controllers and field devices on various networks, autonomous controllers can integrate diverse facilities and equipment. What is prioritized regarding the engineering environment, is assuring production system expandability by enabling continuous maintenance and growth of the control logic in which user's expertise is packed and which is thus their indispensable assets. For this, control logic programming languages compliant with the IEC61131-3 standard of the International Electrotechnical Commission were adopted and it was made possible to hierarchically structure applications using software parts for effortless and efficient engineering at the initial system configuration as well as modification and expansion. Basing a system on an international standard ensures high expandability and upward scalability over the years. Versatile Data Server Software (VDS) is the operation and monitoring software for a personal computer, and consists of two parts, human machine interface (HMI) and a data server. The data server functionality is based on the acclaimed, object-oriented production line configuration software. The HMI functionality uses cutting-edge network technologies and presents a graphical operation and monitoring environment on a Web browser. Although the control logic needs to be developed in a standard engineering environment, it is desirable to apply the leading technology of the day for HMIs. At present, this must mean a Web-based HMI using platform-independent Hypertext Transfer Protocol (HTTP) and Java. Employing HMI functionality of this type enables even portable terminals such as PDAs and cell phones to be used as HMIs, allowing operation and monitoring from anywhere, anytime. The biggest benefit of a Web-based HMI is integration with other applications such as a process information management system (PIMS), a laboratory information management system (LIMS), and a plant resource manager (PRM). Simply setting hyperlinks to the URLs of other desired Web pages will build an integrated, flexible operation and monitoring system. In addition, industry-standard interfaces of the data server, such as OLE for Process Control (OPC), facilitate links to corporate framework software including ERP and MES. These various functions of VDS will enable remote operation and maintenance via the Internet as well as actualizing full-scale collaboration, such as outsourcing, between corporations. To attain the agility required by e-RM, such as allowing a prompt start of manufacturing a new product, the time required for configuring or modifying applications must be shortened. 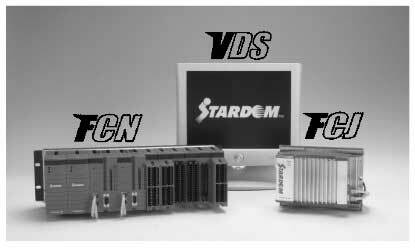 For this, STARDOM provides comparatively sophisticated and quality-assured software parts. Assembling these ready-made parts in a similar way to which a prefab is constructed allows the user to configure a system in a shorter time. The pre-configured bundles of software are known as Applications Portfolios (APPF). They consist of high quality software applications containing the expertise of Yokogawa and its partners for low cost, quick implementations. The APPF contains sophisticated control sequences, application-specific control functions, and the necessary communication functionality for specific processes such as boiler control and energy savings. As aforementioned, agility is essential to actualize e-RM. The optimum supply chain must be considered, and the changes of requirements in the upstream and downstream such as changes in demands of product kinds or manufacturing quantities need to be responded to without delay. Consequently, manufacturing plants themselves will alter their form to agilely respond to changes. In particular, small-scale application-specific plants will be constructed to meet production quantities. Or, a plant will be divided into modules by function, and the modules will be added or changed for modification, expansion or diverted to a different plant. A plant of this style is referred to as "a modulus plant", and production by a modulus plant as "module-based production". We believe that the networking versatility, autonomous controllers, and APPF offered by NCS will play a major role in gaining the full benefits of module-based production. Utilizing the latest network technologies, the STARDOM embodied in the e-RM model will have let today's manufacturer prosper in the harsh world of global competition. The technology allows the information links, agility and reliability necessary to maximize profits and evolve with the current high-tech environment. We will enrich a variety of APPF including "business objects" that allow process information to be presented in a business format, and will also enhance the information links of pro-business data (cost efficiency, operation efficiency, facility management data, etc.) adopting Extensible Markup Language (XML) in the data representation. Thus, the STARDOM will allow your companies managers the agility to make the correct decision quickly and reliably. electronic Realtime Manufacturing, STARDOM, and CENTUM are registered trademarks of Yokogawa Electric Corporation. Application Portfolio is under application for a registered trademark. Other product and company names appearing in this paper are trademarks or registered trademarks of their respective holders.